Due to its popularity on social media the last few days, I have decided to tell the story behind the “Manta Train” photo. 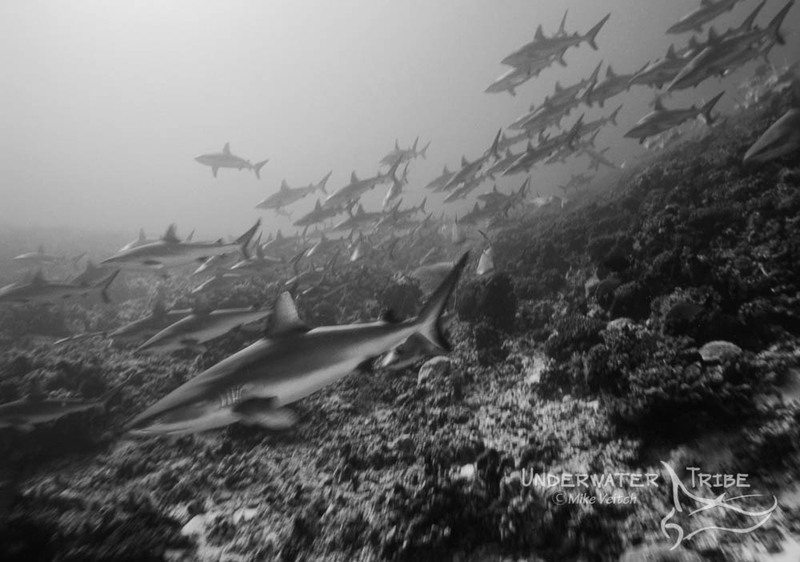 This photo was taken in Yap, Micronesia on a dive site called “Valley of the Rays”, in Goofnuw Channel, a passage that connects the lagoon to the open ocean on the North East side of the island group. From the months of May/June through to Oct/Nov, mantas are often found in this channel hovering above one of several cleaning stations while being swept clean of parasites by a variety of wrasse and butterfly fish. During certain times of the month, around full and new moon, there can be a lot of plankton in the water (possibly fish eggs from a mass mating event or coral spawning) and large groups of mantas congregate in the channel in order to scoop up this food source. On this particular occasion, I had arrived on a boat with Yap Divers (Manta Ray Bay Hotel), early in the morning and the conditions were perfect; sun, flat calm sea, and the beginning of the rising tide. We jumped in the water at the edge of the pass and began to slowly drift into the channel with a mild current. Not long after, we began to encounter small groups of mantas swimming back and forth along the water column, their mouths agape, scooping up nutrients from the water. As we drifted further into the channel, the groups of mantas became ever more numerous and the encounters continued non-stop; both near the surface as well as up to 10-15 metres deep. 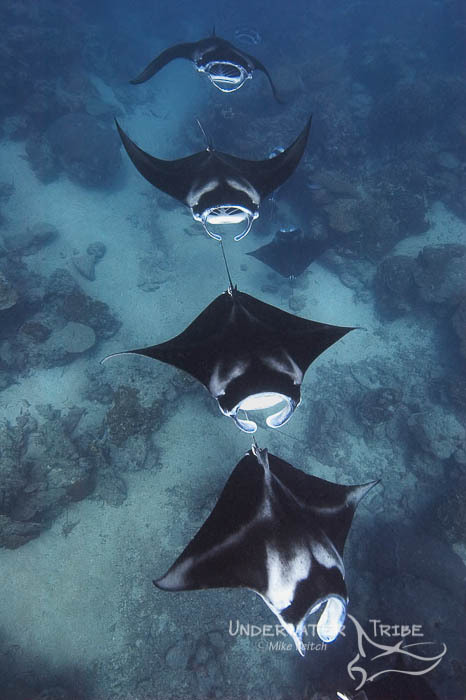 An interesting behaviour of feeding mantas is that they often “draft” one another in long lines with the one behind slightly higher in the water column than the one in front, similar to how a cyclist stays close to the rider in front to improve aerodynamics. This behaviour allows the manta situated behind to scoop up plankton that has been pushed over the top of the manta in front, allowing for a more efficient feeding action. For this photo, I was hovering not too far from the surface when a large group of mantas in feeding formation turned and came racing toward me with mouths wide open. As I saw them turn I immediately swam downward and was able to situate myself just above the “Manta Train” and fire off a series of shots. This shot is my favourite and I believe it’s the one that captures the mantas behaviour best; a close inspection reveals 8 mantas in this photo. This was one of my favourite recent photo shoots, shot on 31 Dec 2013 in the Misool area of Raja Ampat. I was lucky enough to accompany a large private yacht on two expeditions in Indonesia this past year through Komodo and Raja Ampat. One of the best things about this particular vessel, other than the 7 storeys of incredible luxury and a fantastic crew of 40, was the fact it has a helicopter on board! Not only did the boat have a helicopter but, the owner is an extremely down to earth and friendly person who was always asking different members of the crew if anyone wanted to accompany him and the pilot on one of their flights. On the last day of our time in the Misool area, he asked me if I would like to accompany and take some photos as well, I certainly didn’t hesitate to say yes! This photo was one of the ones that I was able to take during a moment when we “stopped” the heli and I could open the door to take some shots. 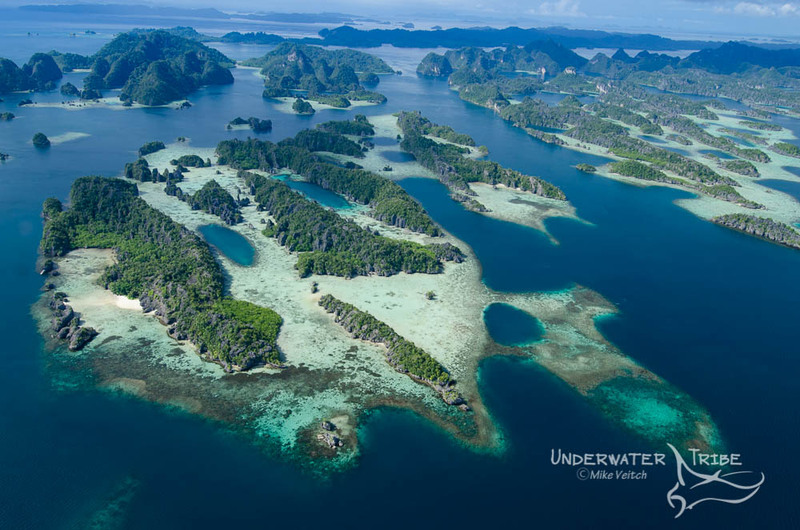 All in all, an absolutely incredible hour was spent flying along the archipelago of islands that juts out from Misool near the Tomolol cave system and continues to the Daram island group. This is one of the harder photos I have ever taken! Back in 2012 we (the Dive Damai) were exploring the Indonesian island chain of Halmahera, an area that is not well known to divers as it’s off the beaten path, lying between Raja Ampat and North Sulawesi. We were transiting between Raja and Halmahera and stopped at the small island group popularly known as “Pulau Pisang” or “Banana Island” to dive on the pretty reefs that are located in the area. I had already visited this area several times over the previous few years and looked forward to diving on a site that boasted a large population of fusiliers, surgeonfish, and red tooth triggers that would school in the currents just off the reef. On this particular trip, we dropped onto the site and enjoyed the schooling fish and bright soft corals that populate the current side of a pair of small islets. However, as we followed the reef around to the lee side we came upon the site of some freshly destroyed coral heads that could only be the work of illegal dynamite fishermen. Obviously this upset me quite a bit, so I went about the process of taking photos of the destroyed coral heads while swearing profusely into my regulator. While I was doing this, one of my fellow divers called me over and pointed out an object that immediately had me exclaiming even louder, an unexploded fish bomb lying on the bottom! I immediately started to tell the group to surface, as I had no idea if this explosive could still be set off. Of course I wanted to take photos of this “bomb” but I admit to feeling a rather deep sense of foreboding in doing it and had trouble convincing myself to get close. I ended up turning off my strobes (didn’t want the electrical circuit to set anything off) and zoomed as far as I could before snapping off a couple of quick shots all the while anticipating the bomb going off with each camera click! 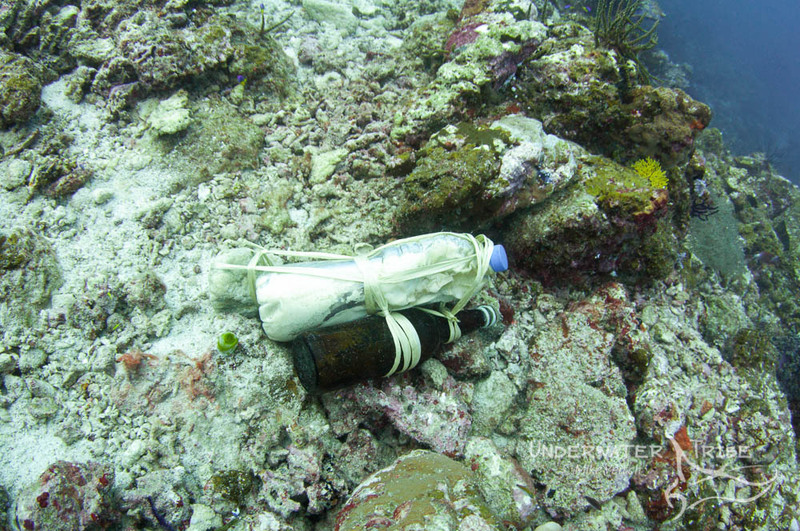 Although the shot is certainly nothing spectacular, it does show how simple these home made “reef bombs” are: a couple of bottles filled with fertilizer and diesel or kerosene plus a wick. What is scary is that these items are made from pretty easy to get ingredients but pose a huge threat to reefs. I am happy to announce a new series of blog posts that I call “Behind the Shot”, basically one photo (or a series of photos) where I will explain what particular technique or idea that I used to get the photo. Some of the posts will be technical but most will just discuss an interesting photo and what my thoughts were when I was trying to capture it. These photos will consist of both underwater and land based photographs and will encompass images from my library dating back to the 90s. Hopefully I will post one or two of these a week and I will also cross post them on the Underwater Tribe Blog as well.